The Barbershop Cuts & Cocktails , located inside The Cosmopolitan luxury casino, offers guests an experience like no other. Our vintage venue harkens back to a simpler time when whiskey was king, and a person’s word was gold. When you enter The Barbershop Cuts and Cocktails, you will be transported back in time to Prohibition-era America. From the front, The Barbershop appears to be a classic barbershop to get a clean cut before heading out for a night on the town. Master Barber Jose Sosa and his team, offer guests stylish cuts and shaves in a unique, luxury barbershop. However, sometimes there is more than meets the eye. If you step through the unassuming janitor’s door at the back, you will discover The Barbershop has much more to offer than classic cuts and expert styles. Carefully hidden away behind a speakeasy-style door is our swanky bar and music venue where guests lounge on leather couches, sip cocktails, and enjoy a luxury bar experience. Sidle up to the bar and order a craft beer or your favorite whiskey just the way you like it–neat, a splash of water, on the rocks? However you enjoy your whiskey, our bartenders have you covered. Are you ready to experience The Barbershop? Join us for three days of exciting events as we celebrate our Grand Opening and St. Patrick’s day with live music, high-end whiskey, and expert styles and cuts. We invite you to join us at The Barbershop for our official Grand Opening on March 15th. This will be an event to remember! For our Grand Opening celebration, we are welcoming musical guests Bush to the Barbershop. This English rock band is here for one night only, so don’t miss out. While you enjoy your favorite rock classics, sip a craft beer or your favorite whiskey prepared just the way you like. After the show wraps up at 12 am, we will open our doors to the public. The barbershop portion of our venue will be open during and after the Bush show, but space is limited. Please visit our website to make an appointment for an expert cut, style, or shave. On March 16th, The Barbershop welcomes our house band The 442s, an acoustic instrumental group whose music explores the boundaries of jazz, classical, folk and rock music. After the show, The Barbershop will open to the public at 12 am. Once again, the barbershop portion of the venue will be open, but please make an appointment on our website to ensure your spot. Are you looking for a unique St. Patrick’s Day experience? The Barbershop will be open from [time] to [time] to help you celebrate St. Patrick’s day in style. Enjoy an authentic speakeasy experience right in the heart of the Las Vegas Strip. Are you searching for a unique space to host an event? Whether you are planning a birthday party, a corporate event, bachelor or bachelorette party, our venue has just what you need. Featuring glitzy vintage details, a well-stocked whiskey bar, and impeccable style, The Barbershop is an ideal place to host your next gathering or event. Host a table for just a few friends, or rent out the entire venue for parties of up to 350 guests. The choice is yours. Where is The Barbershop Cuts and Cocktails Located? The Barbershop is in The Cosmopolitan, a luxury resort and casino located right on the world-famous Las Vegas strip. We are situated on Level 1 in the Boulevard Tower. 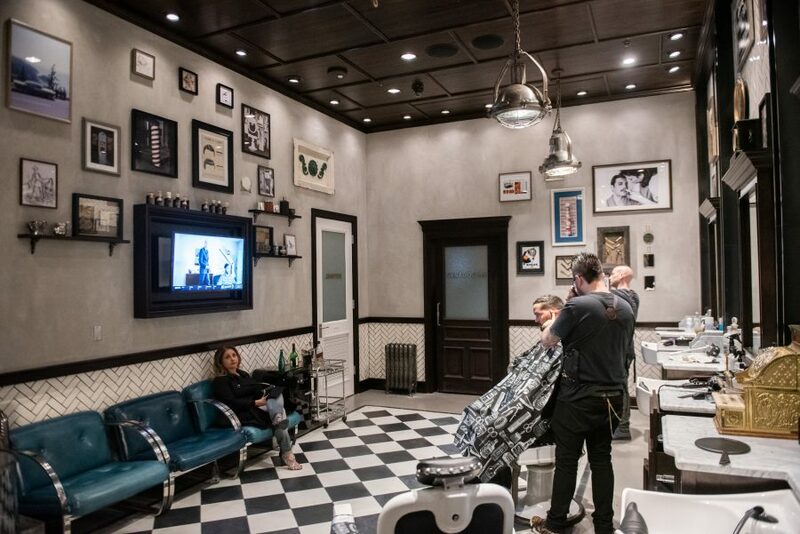 To enter our speakeasy-style bar, you first need to enter into our Barbershop, where master barber Jose Sosa and his nationally renowned grooming team offer expert styles and old fashioned shaves. In the back of The Barbershop, there is an unassuming janitor’s door. This harkens back to the days of Prohibition, where style mattered, and the whiskey only flowed behind closed doors. Open the janitor’s door and you are met with a dazzling vintage bar filled with vintage details, a large selection of your favorite high-end whiskeys, and live music. The Barbershop is more than a bar, it is an experience you won’t want to miss.